Veeam backup agents can operate in two modes: unmanaged and managed. Unmanaged — in this mode, Veeam backup agents cannot be managed in Veeam Availability Console. Standalone Veeam backup agents that run either a free or a paid product version. Veeam backup agents managed by client Veeam Backup & Replication servers. End users working with Veeam backup agents directly can access all available functions, update the product and submit support cases to Veeam Software in the Control Panel. Managed — in this mode, Veeam backup agents can be managed in Veeam Availability Console. You can configure backup job settings, start and stop backup, change global settings, update and uninstall Veeam backup agents, and collect Veeam backup agent data for monitoring and billing. Users cannot submit a support case to Veeam Software in the Veeam backup agent Control Panel. To obtain support, users must contact their backup administrator. Users cannot update Veeam backup agents in the Control Panel. Automatic updates are also disabled. To update Veeam backup agents, users must contact their backup administrator. Users cannot install or change a license, and cannot switch Veeam backup agent to another edition. The role of the backup administrator can be performed by the service provider or by a backup administrator in the managed company. In the managed mode, Veeam backup agent Control Panel displays the name of the service provider company at the top left corner. 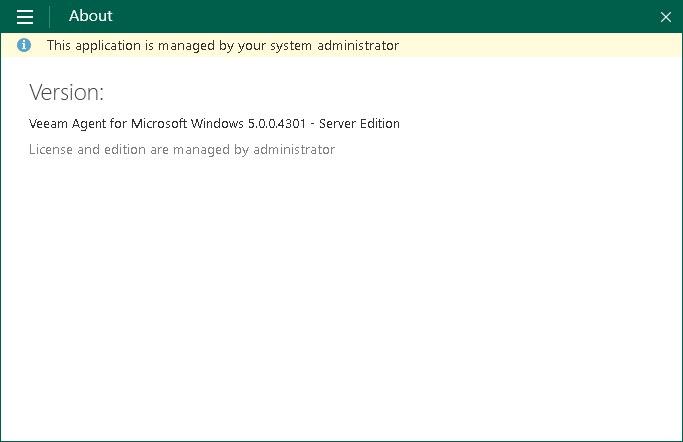 The About section in the Control Panel displays a notification saying that the license and edition are managed by administrator. To manage Veeam backup agents in Veeam Availability Console and monitor the state of computer data protection, you must activate Veeam backup agents. Every activated Veeam backup agent requires one or more Veeam Availability Console licenses, depending on the computer platform and the backup job mode. When you install Veeam backup agents using discovery rules, or initiate Veeam backup agent installation in Veeam Availability Console, Veeam backup agents are activated automatically. You must manually activate Veeam backup agents only if Veeam backup agents were installed outside Veeam Availability Console (for example, using GPO), and therefore were not registered in Veeam Availability Console. To activate Veeam backup agents managed by client Veeam Backup & Replication servers, you must remove these agents from Veeam Backup & Replication console first. For details, see Veeam Agent Management Guide. To display all unmanaged Veeam backup agents in the list, click Filter, and in the Filter by installed license section select Not activated (Unmanaged) and click Apply. Click Activation and choose Switch to Managed Mode. After you activate a Veeam backup agent, Veeam Availability Console will assign one or more licenses to it. The Veeam backup agent license status will be set to Managed. The number of used and total licenses in the Veeam Availability Console license pool will be updated. To display all managed Veeam backup agents in the list, click Filter, in the Filter by installed license section select Activated (Managed) and click Apply. Click Activation and choose Switch to Unmanaged Mode. After you switch Veeam backup agents to the unmanaged mode, Veeam Availability Console will revoke licenses from it. The number of used and total licenses in the Veeam Availability Console license pool will be updated.